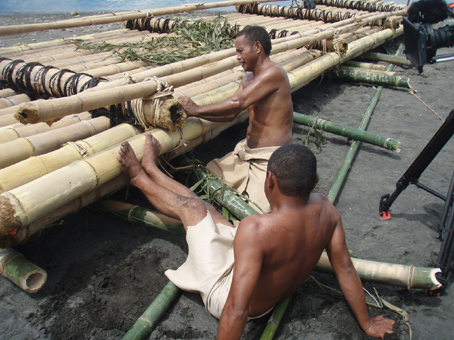 In April 2008, further experiments with a stone-tool-built bamboo raft and the associated preparation and construction work were conducted in partnership with National Geographic, this time at Flores. 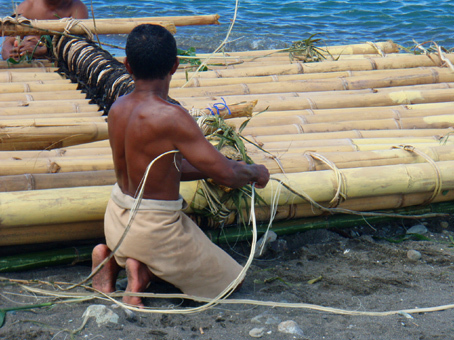 This volcanic island, located east of Bali, was occupied by Homo erectus at least 840,000 years ago, whose ancestors had travelled there almost certainly by bamboo rafts. In this instance, the crew members were requested to dress in animal hides by the film producers, Granada Films. 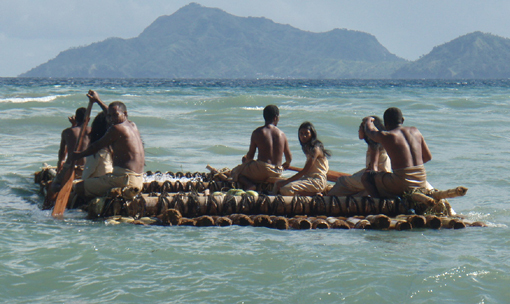 The crew, men from Rapovendu, Kecaman Nangapanda, near Ende, are completing the 1.1-tonne raft, using split forest vines. These are locally called kua and derive from the Calamus family. The vines occur in profusion in the forests near the assembly site at Rapa Beach and their harvesting, as well as the felling of bamboo with stone choppers, was documented on film. The community’s women were also keenly involved in the project. 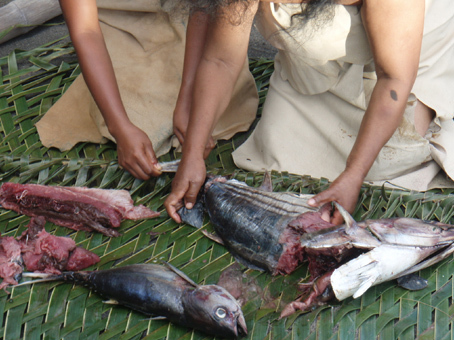 Here two of them are gutting a tuna with stone tools; note one in the hand of the woman, and a small flint flake to the right under the fish. The mat has been woven from the fronds of the coconut palm. 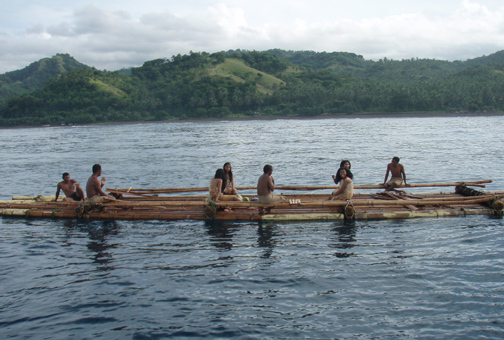 Trials with the raft off the southern coast of Flores. Some women have now joined the men. The First Mariners Project is the largest archaeological replication project in history and is continuing. The definitive book The first mariners is in press.